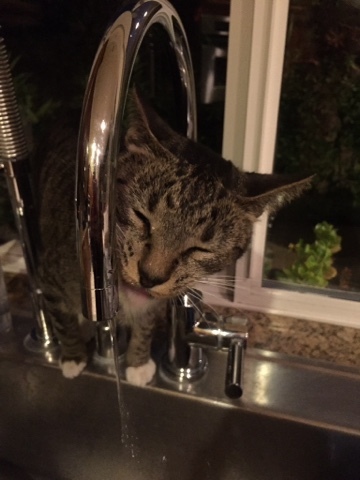 While we were visiting with our friend who lives in California, we discovered that his cat Smokey likes to drink water from the faucet in the kitchen! If you missed our California vacation you can read about that HERE. Thanks so much for stopping by, Julie!! Now to teach the kitty how to turn the water on, right? I always think it's so funny to see cats sleeping the bathroom sink because I know how much they actually hate being in water. Thanks for joining my #WW linky party, Julie! Those kitties!! Reminds me of a cat we had growing up whose name was Sheba as in the Queen of which she thought she was!! My Charlie loves to drink water from the bathroom sink. He sits on the counter and waits for me to turn it on! Funniest thing! Awww.... what a cutie pie! Have a lovely Wednesday, sweet friend! So cute, Julie! We have a cat, that will paw it, then drink it. Happy WW! Thank you for sharing at #OMHGWW! Hope you have a beautiful week! Ha! Cats love running water! Oh Julie, how cute is that - now teach him to turn the water on and off. I am surprised that he doesn't drink from the pool. Sweet Kitty! My Oliver does the same thing. Fresh water is a must for him! Thank you so much for stopping by and leaving me (as always) a sweet comment. BTW...Your trip to San Francisco was wonderful!!!! I love San Francisco...it's the one city I could never get tired of !!!! Cute! Our male cat, Oreo, does that, too. Awww so cute! Our cats loves doing this as we they live in a tropical country! So cute, smart cat <3!